The Challenge: Learn how to do something new today. Your time limit: 30 minutes. It’s been a long time since I really learned something new. My Adultitis has driven me to a place I call “Rutsville.” Maybe you’ve heard of it? The days go by so quick. The schedule is jam-packed. There is no slot on my “to do” list that invites or allows me to learn new things. 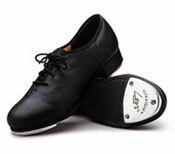 So, today I decided to learn how to tap dance. I think every child has pretended to tap with his/her “clicky” shoes on the kitchen floor. I thought it would be fun to learn a real move. Now, as you’ll see from the video, 30 minutes wasn’t nearly enough. I don’t own real tap shoes so I stole a page out of my childhood and found some “clicky” shoes to use — my new red heels I’m wearing in my sister’s upcoming wedding. They looked really good with my jeans. I’m so glad I didn’t break a heel. For any of you who may be looking to learn some sweet tap moves check out my teacher’s tapping feet here. I just love that sound! I remember putting on magic shows as a kid. You know, for my parents. I’d dress up in a bathrobe (not sure why, exactly), set up a TV tray to be my table, and boom, I was a regular David Copperfield. (I’m sure he started out in bathrobes, too.) I do not recall one actual trick that I did, but the fact that they were spectacular should go without saying. I decided that 30 minutes was more than enough time to learn a magic trick. (But not a very good one, I found out 20 minutes into it.) Not only could I perform it on today’s video, but I could amaze my nieces, who are coming up for a visit this weekend. Well, it didn’t take long to learn that the “super easy” coin tricks don’t work to well when you have the finger coordination of a giraffe and the grace of a three-legged elephant. 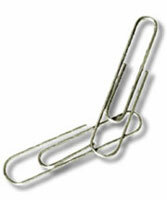 Happily, I was able to perfect a dancing paper clip trick that delighted me to no end. With the help of George Washington (in the form of a one-dollar bill), I can effortlessly join two paper clips with the greatest of ease. At the risk of engaging in a bit of hyperbole, it will leave you absolutely breathless. Eat your heart out, David. This entry was posted in All Challenges, Challenges 11-20 by kim and jason. Bookmark the permalink. When I was on the phone with my mom yesterday (see Challenge #16), she dropped her usual line “I wish just one of my girls would take up crotcheting.” For the longest time, ZERO interest. But I’ve been kicking it around and thought, “why not?” I could maybe make a very fun scarf and have something to do instead of stuff my face in front of the TV. I would miss that though. 🙂 So, while I know it won’t take 30 minutes, I’m taking the plunge. I’m going to check out some how-to sites and even better, I’m going to email my mom. Hey, she just may get over her fear of planes and hop over hear with a needle and yarn! I have about a bazillion old t-shirts that I can’t bear to get rid of/give away. I’ve been toying with the idea of making a t-shirt quilt – which would make Mom and Dad happy to have the large box out of their basement! I have two friends who sew VERY well. I’m going to do some online research on the how-to’s about the quilt and enlist the help of my friend(s) to complete the project….who knows, maybe I’ll learn a little about sewing in the process, too! Today I learned how to carve soap. Yes, soap. 🙂 I spent about 15 minutes on-line reading about tips and tricks. Then to my delight I found that I actually had a bar of soap in the house. (Remember when soap was a bar and not a liquid?) I spent about 15 minutes on my initial carving. The first person I showed it to, knew right away what it is, even though it’s not even half finished. It’s a fun thing to do and easy to clean – the soap just washes away! It’s never too late to teach an old dog something new. Besides selling lumber and everything else you could imagine you would need for your home improvement project we also sell in bulk, coal(yes coal, that black stuff), sand and various types of gravel. I can drive every vehicle at Maze Lumber except the tractor. So I had the yard manager Craig give me a lesson. I learned how to start it, stop it(YES!) and turn it off. The one we have is 2 speed with 8 different levels. I worked the levers that raise and lower the bucket and cause it to load and dump the stuff. With my new skills I could go forward, backward and turn the wheel. I learned to appreciate the skill it takes to run the tractor. I understand now how it was possible for our yard guys(the new ones) to place the bucket thru the back windshield of a pick up truck (twice in one day).The levers can be tricky. That being said I feel that in just 30 minutes I have the skills to actually load up a customer with something. But just to be safe maybe I’ll load up something on one of our trucks first instead of a customer’s $25,000.00 pick up truck! I’m going to learn how to make banana cake. I haven’t had a chance to do it yet, but plan on cooking it tomorrow night. I’ll post the recipe when I’m done. It should be really tasty. You guys are absolutely fabulous! I’m going to start following your example (and the challenges you’ve ladi out) as of tonight! I spent thirty minutes today learning a new Beatles song on my guitar. The song in question, “Baby It’s You” Made famous by The Ronnettes I believe. Verdict: Still needs work. Because I have some very dear Japanese friends, I’ve started to learn some basic phrases through an on-line course. As well as exercising my brain, I look forward to surprising them.